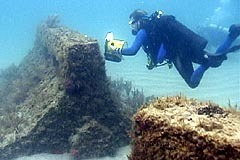 The Palm Beach County Reef Research Team conducts video surveys of the artificial reefs as part of our monitoring grant. The team owns a camera and a housing, and tries to keep 3-4 trained videographers available so all our dive requirements will be covered. This training is required before a member can do the video tasks. Classes consist of a one hour land based session on preparation and use of camera and housing, followed by at least 3 in water dives with the instructor, where the student learns the techniques for video monitoring to the PBCRRT grant requirements. Post dive training includes the cleaning and storage of the team camera and housing, and generating a video log for the report. Training is conducted when mutally convenient with the instructor and trainee. In water instruction occurs during regular team monitoring dives. Training only occurs when a need exists, and is not automatic with membership. Pre-dive camera tape and battery preparation and checkout. Pre-dive housing inspection and camera checkout. Water entry with the equipment. Creation of a video log.